Thanks so much to our customers for making our pre-order event event a huge success! Our shipping backlog has now been cleared and new orders will ship as we receive them. We have even more high-res additions to our professional lens lineup, with lots more CS and C-Mount lenses being added. New C-Mount adapters for Canon, Nikon, Pentax, Sony and more are now available. Stay tuned for lots of great new content and some fun contests! After several rounds of design changes, refinements and testing the Ribcage mod for GoPro Hero3 and Hero3+ Black is complete! The new design features a removable tripod mount with three mounting positions, adjustable flange distance for precise lens control and much more! Use almost any lens by connecting M12, CS-Mount and C-Mount lenses. Connect almost any other type of lens with C-Mount adapters. 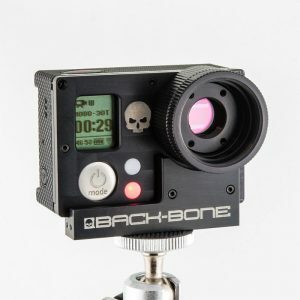 You’ll be able to take full advantage of the great resolutions and frame rates of the Hero3+ Black, but now with manual focus and depth of field, making it a perfect solution for indie films and big productions that need to get cameras in tight spaces or are looking for a killer, cost effective solution. Its light weight makes it an ideal camera option for multi-rotor RC rigs! Posted in Latest News and tagged RIBCAGE IS AVAILABLE NOW. GoPro probably didn’t have this in mind when they designed the Hero3+ ! We finally had a chance to test out the Ribcage on our Telescope. These images and the video below were taken by attaching a c-mount to 1.25″ nosepiece adapter to our Celestron C6 750mm Newtonian Reflector telescope. No lens was used on the Ribcage. It’s great to be able to see everything through a field monitor and not have to peer through an eyepiece. We can achieve additional magnification by using a barlow, however we didn’t have one when this was shot. Posted in Blog and tagged astronomy, back-bone, backbone, black, c-mount, gopro, gopro hero 3 black, hack, hero, hero 3, interchangeable, IR Cut, kit, lens, mod, modification, moon, telescope. INTERCHANGEABLE LENSES ON GOPRO HERO3+ BLACK! Our current lead project is the Ribcage mod kit for GoPro Hero3 and Hero3+ Black. We all have been very impressed with the amazing capabilities of this intrepid little camera, from its small size, to its WiFi remote and camera syncing and its wide array of excellent shooting options. We see a great opportunity for a wider variety of filmmakers to make use of these features by constructing a new housing and accessories for the camera. This will allow the user to not only connect any widely available M12, CS or C-mount lens, but also almost any other manual camera lens available via an adapter ring. SO WHAT ARE THE ADVANTAGES OF THE RIBCAGE? For the latest news check our blog page frequently, or follow us on Facebook and Twitter (@backbonehu). Great things are coming! Posted in Latest News and tagged PROJECT: RIBCAGE.